Let The Garden Hen make your next Team Building experience eggcellent!!! Chicken Mike and Nicole, The Garden Hen herself will come to your office, home, or work space and provide a most unique team builder. Team building with chickens! Your group/team will receive a small 7 egg digital incubator, fertile hatching eggs, and a guideline to what to expect durning the next 21 days. Durning the 21 day incubation period, Chicken Mike and Nicole can provide short, yet informative live demonstrations involving their personal chicken, the infamous Pinecone. After a conveniently scheduled time, Pinecone and usually one of her sisters visit the “team” in their small backyard mobile-coop. Chicken Mike and Nicole will discuss with the “team” how they raise city chickens, chicken adaptation skills to different environments, and how they have built a business educating folks how to get fresh eggs in their own backyards. There is also the ability to have a local chef cater or even cook an egg related meal/tasting for your “team”. From personal quiches prepared by Chef Ryan Hildebrand, to a pasture raised egg salad sandwich all of which using The Garden Hen’s eggs. You can customize your own unique Team Builder! 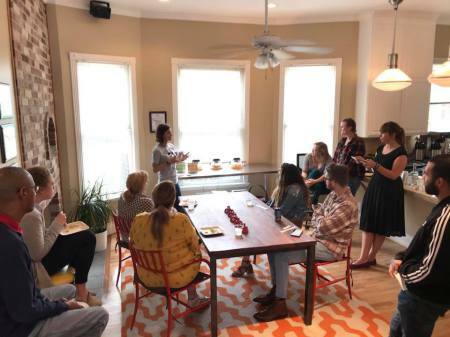 We started this team building concept in 2017 and launched it at Houstonia Magazine’s corporate headquarters. They absolutely loved their experience! *Call us or email today with any questions on how we can customize your next team builder! “Having The Garden Hen organize a chicken hatch for our office has been one of our most fun memories to-date. Divided between 3 floors, and with many people in-and-out, days can go by before you see someone, even if you’ve both been in the building. When we had our chicks, you could go down to the brooder and at any given moment at least one person would be there observing or playing with the chicks, or watching the next baby breaking out of its shell. Thank you, Chicken Mike and Nicole, for such a special and sweet experience. You guys were helpful, knowledgeable, communicative and so supportive throughout the whole process. I’d recommend this team building effort to anyone!"